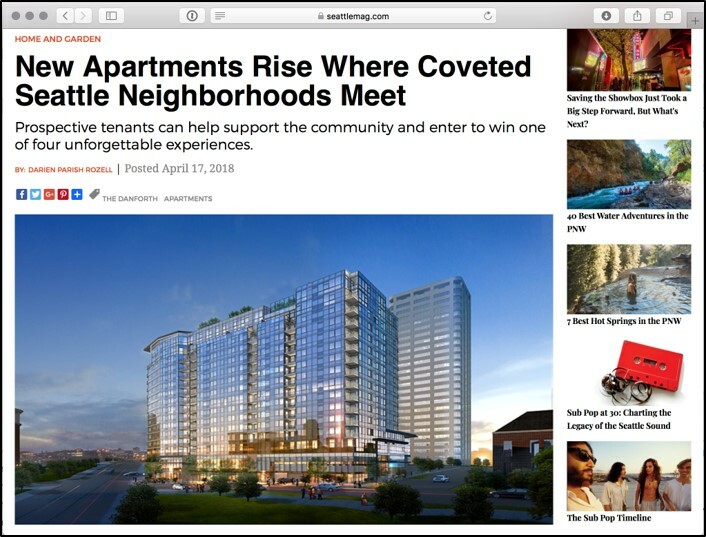 Given the saturation of new apartment buildings in many markets, including Seattle, we wanted to share a bit about our recent experience helping with lease-up of the Danforth, a new high-rise at the junction of Seattle’s Capitol Hill and First Hill neighborhoods, and Seattle University. We think it’s a great example of an alternative to touting concessions and unit features to drive leasing. Red Propeller has been involved with this project with developer Columbia Pacific Advisors since the planning stages, and built a strategy that focused on anchoring the surrounding neighborhoods (a Danforth is a type of anchor). When it came to marketing, we sought to establish the project as a denizen of Capitol Hill. First Hill and Seattle University, while also connecting with the caring, altruistic inclinations of the project’s target audience. The resulting “Live well, do good, have fun campaign” sought neighborhood input on which of three local nonprofits would get $5,000 in funding (with the other two getting $2,500).The nonprofits were chosen with the three neighborhoods in mind, with Seattle Humane connecting to Capitol Hill’s love of dogs, Country Doctor Community Health Centers relating to the medical focus of First Hill and the Artist Trust tying into the intellectual pursuits of Seattle University. 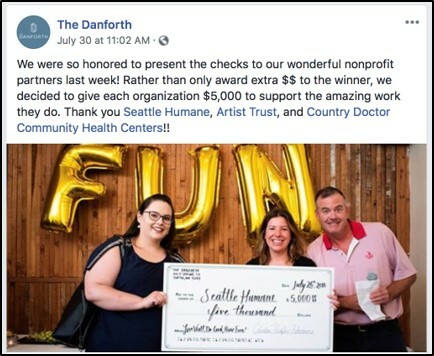 The nonprofits helped promote the effort, which drew several hundred thousand mentions on social media, coverage by local and industry blogs and publications and more than 3,500 votes (along with the email addresses of voters, who were entered to win one of four distinctive experiences that reflected the lifestyle of the Danforth). Everyone who voted was invited to a culminating event at Optimism Brewing, where Columbia Pacific awarded all three nonprofits $5,000. 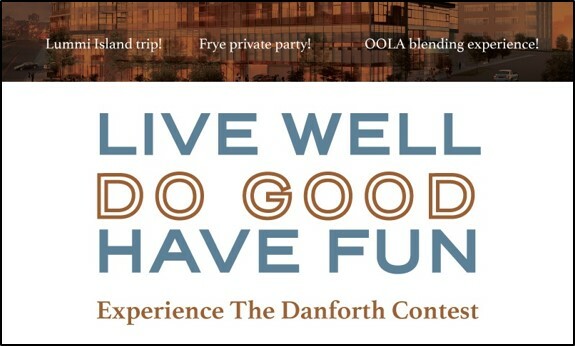 The campaign established the story of the Danforth within the community, creating buzz about what the Danforth was, as opposed to its unit sizes and features, amenities and concessions. We also conducted a full-day training program with the leasing team to teach them how to sell the story of the building (again, rather than focusing on “spreadsheet” items like units, amenities, rent and concessions). Thanks to such efforts, the Danforth was nearly 40% leased by the time of opening, and outpacing proforma expectations and leasing goals.